On Easter weekend, April 19-20th, Franklin Graham will share the Gospel at the Festival de Esperanza (Festival of Hope) in the border town of Cucuta, Colombia. 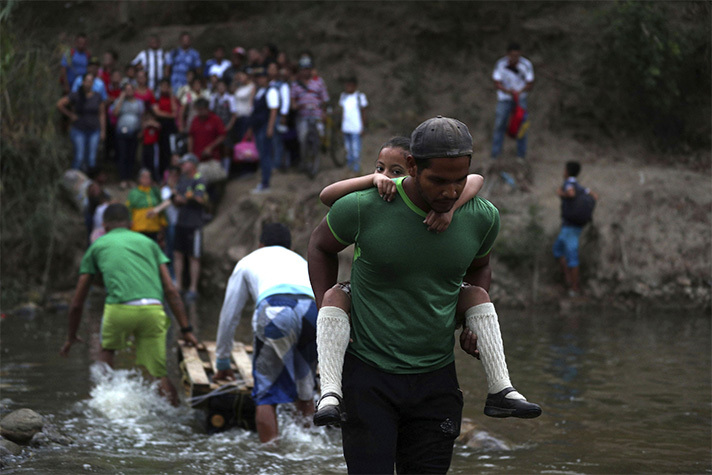 Here, a man gives a Venezuelan student a piggyback ride across the Táchira River from Venezuela into Colombia. On a cool Monday evening, dozens of Colombian and Venezuelan pastors gathered at the closed border, separated by country but joined together in prayer. Though the area can be unsafe, Chris Swanson’s feet remained firmly planted along the Colombian line as his eyes travelled to the Venezuela side. He could see virtually nothing in the South American country due to its week-long power outage. But there was still light. A light carried in the hearts of those pastors clapping hands in praise to God and beyond in cries of brokenness and joy. That light can give anyone hope—even those in the midst of political and economic turmoil with no food on the table. For the past several months, the Venezuela crisis has heightened, with tens of thousands fleeing to seek refuge elsewhere as government oppression has worsened, inflation has skyrocketed and food shortages are common. According to U.S. Vice President Mike Pence, “9 out of 10 people live in poverty in what used to be one of the wealthiest countries in the world,” and Venezuelans have lost an average of 20 pounds per person due to hunger. As this has happened, though, God has not forgotten His people. Just a 20-minute drive from the border, thousands of Colombians have been preparing for an evangelistic event called Festival de Esperanza (Festival of Hope), where Franklin Graham will share the Gospel in Cúcuta, Colombia, on April 19-20. More than 400 churches around Cúcuta are involved in the Festival. As director of Latin America affairs for the Billy Graham Evangelistic Association, Swanson recalls having lunch with Franklin Graham back in October, and Franklin’s desire to help those seeking relief. Franklin witnessed the crisis firsthand, watching people drag suitcases behind them into Colombia while a Venezuelan man walked in the opposite direction—returning to his country, bringing a small bag of vegetables to his family. “What came to light for [Franklin] was an area of huge need relating to the refugee crisis,” Swanson said. That, along with Colombians’ requests for him to preach in the region, resulted in the quick planning for this Festival. It was organised in just six months, half the time it normally takes to prepare for a Festival. Swelling with migrants, the city of 750,000 has recently reached an estimated population of 1 million. Considered a forgotten city itself, Cúcuta is the birthplace of Colombia and surrounded by mountains. Its growing population brings along human trafficking and drug issues. “Cúcuta is a big city, relatively speaking, with a small-town feel,” Swanson said, further explaining word of mouth spreads like wildfire in the area. He’s already seen news of the Festival take off, as a group of 4,500 youth gathered last week to learn more about the event that’s set to take place on Easter weekend. “We ran out of chairs,” Swanson said. Repeatedly, he’s witnessed people draw to Christ while preparing for the Festival, including those participating in Operation Andrew (OA). This tool encourages people to share the Gospel and invite their friends and family to the event. Each person in OA receives a card where they typically write down two or three names of who they plan to bring. Swanson heard about one man in his late teens who began to write names on his OA card—and didn’t stop. He explained, “I’m writing down 15 names.” Before he’d come to know Christ, he’d been in a gang with 15 other members, and now he plans to bring all of them to the Festival. Pray for the Estadio General Santender to be properly prepped and equipped for thousands to fill the stadium. Built in the 1940s, this arena has numerous logistical details to be taken care of before the Festival occurs. Pray for the weather to be cloudy and cool at the open-air event. “In April, it’s not unheard of for it to be 100 degrees,” Swanson said. Pray for the border situation. Ask the Lord to open the border up so Venezuelans will be able to hear the Good News. More than 6,500 Colombians are taking the Christian Life and Witness Course to learn how to share the Gospel. Please pray for their boldness to invite people to the event. Do you have a relationship with Christ? Trust Him today.